Rookie Vebjorn Aishana reitan has edged past Laura Neese to hold onto fifth position in the 2018 Yukon Quest. Reitan checked into Dawson City at 10:15 am PST. Neese is still on the trail toward the checkpoint, where all mushers must take a 36-hour layover. Reitan joined the top four positioned mushers at Dawson City. Two-time Quest champion Allen Moore checked in at 7:30pm PST last night. In second position is Paige Drobny, who checked into Dawson City just before 4:30am PST this morning. Last year’s Quest champion, Matt Hall, remains in third position. He reached Dawson just after 5 am. Canadian musher Ed Hopkins has pulled into fourth position, checking in around 8:30 am PST. Tune into KNOM at 5 pm to hear the latest from the 2018 Yukon Quest. The top four positioned mushers in this year’s Yukon Quest have begun their 36-hour layover in Dawson City. According to the leaderboard, Allen Moore maintains his lead after checking into Dawson City at 7:30pm PST yesterday evening. Through a statement from Quest staff, Moore referred to his run over the American Summit as uneventful, with no wind or snow. 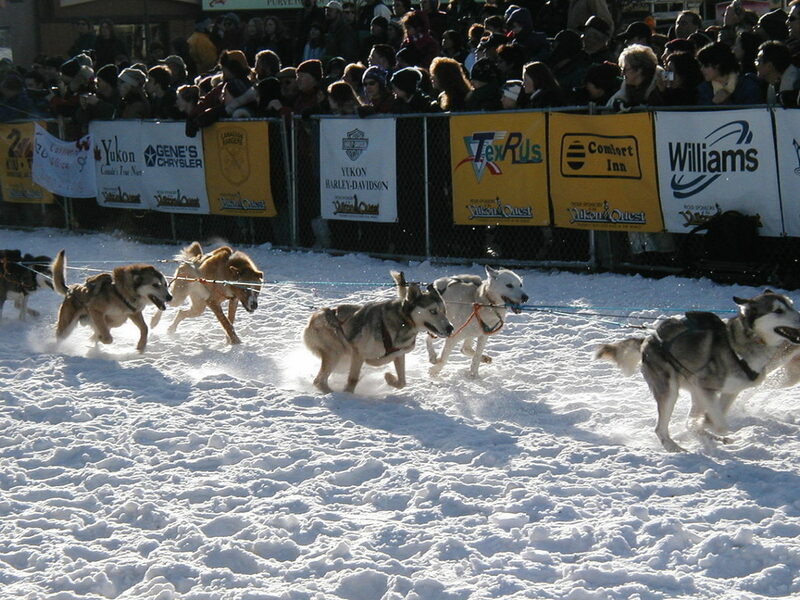 Moore is referring to the 2012 Yukon Quest, when Hugh Neff just edged him out at the finish line. In second position is Paige Drobny, who checked into Dawson City just before 4:30am PST this morning. Less than an hour behind her is last year’s Quest champion, Matt Hall, who continues to hold onto third position. The leaderboard shows Canadian musher Ed Hopkins has jumped up into fourth position, checking into Dawson City at 8:28am PST, while Laura Neese and Vebjorn Aishana Reitan battle it out for fifth. According to weather underground, as mushers approach Dawson City, they are heading into temperatures of –45° or colder. With the staggering cold, race marshal Doug Harris says the Yukon River ice is not jumbled this year but instead more flat near Dawson City. Harris reiterates that the route is the same, but the trail is slightly different around Dawson to accommodate the holes along the icy river. Image at top: file photo: a sled dog team leaves the Yukon Quest starting line in Whitehorse, Yukon Territory, 2003. Photo: public domain.